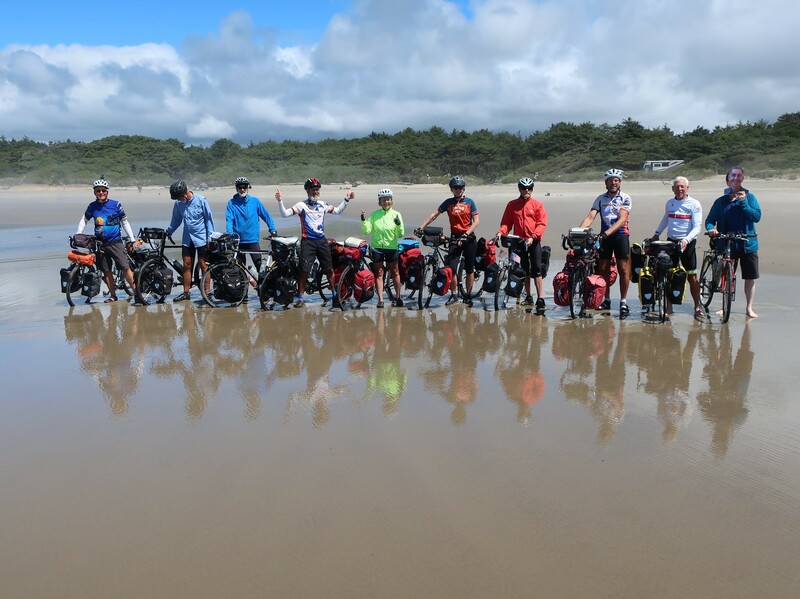 Yesterday, we finished our ride across the US and dipped our front tires in the Pacific, after finishing the Trans America Route. Three months and 4,100 miles ago, we dipped our rear tires in the Atlantic. All the way across, we carried tents, camping gear and all the rest. The best part was the people, especially the generosity of strangers. Of course, I also made special friends. Our group leader is something I’ll never forget. 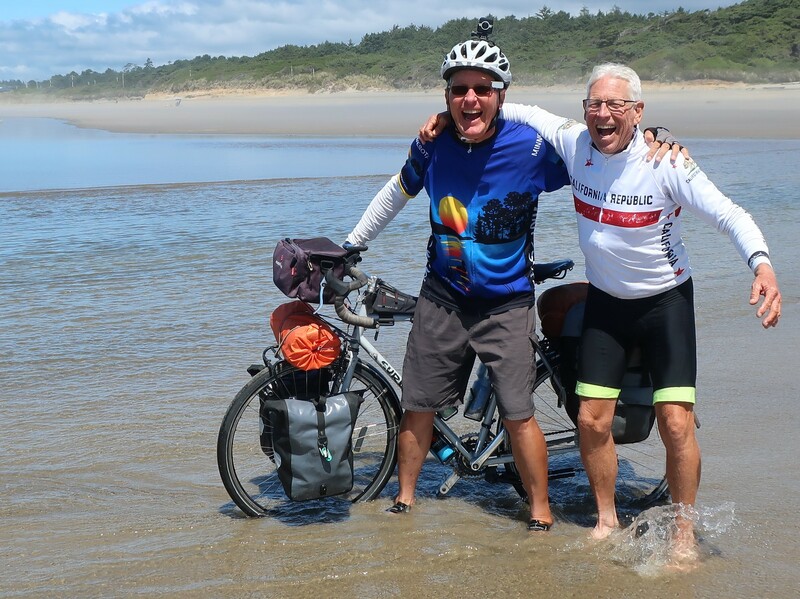 His name is Wally, and this was his 69th bike tour. With all those bike tours, a lot of things have gone wrong, and Wally has learned to deal with problems with rare grace and generosity. Another member of our bike tour who I’ll never forget is Kent, pictured above. He was also calm in tough times. As a cancer survivor, I had emotional moments during the trip. Kent was someone I complained and even cried to. He listened, shared some wise words, and usually had me laughing a while later. I wish I could write something similar about each person in my touring group, but I don’t want to turn this blog post into a written version of a long academy award speech. Having said that, there’s one more special group to mention. They’re the visitors in our country—Chinese, Dutch, Swiss, and my favorite the Brits and Germans. Talking with them can be like a brief visit to their country. I highly recommend it. They also reminded me how much I loved living overseas. Strangely, the trip didn’t seem that hard. We just woke up each day, packed our bikes, and rode them. When we’re tired, we took breaks. Having cancer still makes me feel scared and sad, but I’ve always said that I want to make cancer a small part of my life, take care of it when I need to and forget about it soon after. This trip made that even more important. There’s far too much to enjoy in life. I’ll still be sad when I need to, but too much time feeling sad removes the time I can enjoy life. Besides, many bright doctors have told me that we’re close to curing my cancer, and I’m proud to have raised over $3,000 for cancer research. I still want to reach or exceed my goal of a dollar for each mile. That’s about $4,200, so please consider donating. There is one thing I always get a little sad about, finishing a great bike trip. Of course, the solution is another adventure on my bike, but I enjoyed this trip so much that I’ll let myself be slightly sad about it for a while. Maybe I should talk with Kent.